Piqua’s Qurri Tucker goes up for a shot against Stebbins Friday night. Piqua’s Mick Karn works inside and draws the foul against Stebbins Friday night. Piqua’s Iverson Ventura passes the ball around Stebbins’ Damiene Boles Jr. Friday night. Piqua’s Trey Richmond battles for a rebound with Stebbins’ Jalen Tolbert. Piqua’s Garrett Schrubb gets off a shot against Stebbins Friday night. DAYTON —- The Piqua boys basketball team has the heart of champions. But, the basketball Gods are not with them right now. 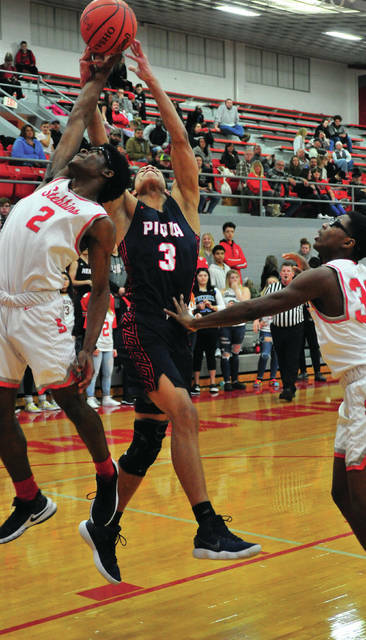 For a third straight game, Piqua rallied from a double-digit lead, but the ball didn’t bounce their way as Stebbins held on for a 70-64 victory in GWOC American action. Piqua had rallied from a 47-33 halftime deficit to take the lead in the fourth quarter. The visiting Indians outscored Stebbins 15-8 in the third quarter to close within 55-48 and continued to rally in the fourth quarter. Qurri Tucker started the fourth quarter with a basket and Garrett Schrubb banked one in off a pass from Iverson Ventura and suddenly it was 55-52 with 6:56 to play. Damiene Boles Jr. answered with four straight points for Stebbins to make it 59-52, but Tucker hit two free throws and Riley Hill scored to get Piqua back within 59-56. 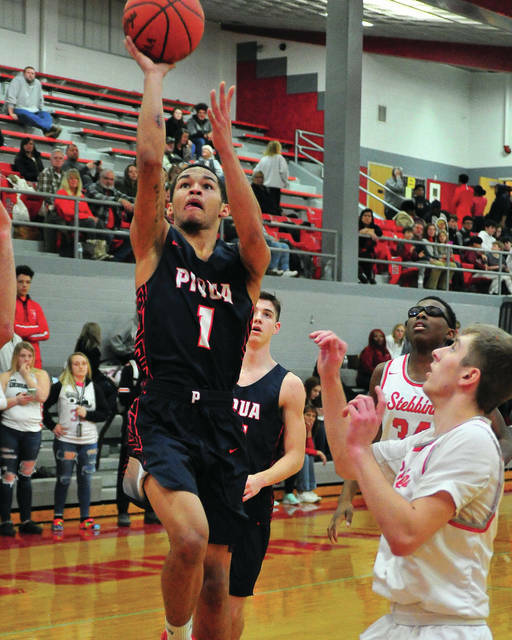 After a Jalen Tolbert basket for Stebbins, Piqua ran off six straight points to take the lead. Trey Richmond scored on a rebound, then Tucker went the length of the court off a steal to make it 61-60. Then, Kameron Darner drove through the Stebbins defense for a layup at the 4:09 mark to give Piqua a 62-61 lead as the visiting crowd erupted. Stebbins took over from there though, outscoring Piqua 9-2 the rest of the way to hold on for the win. 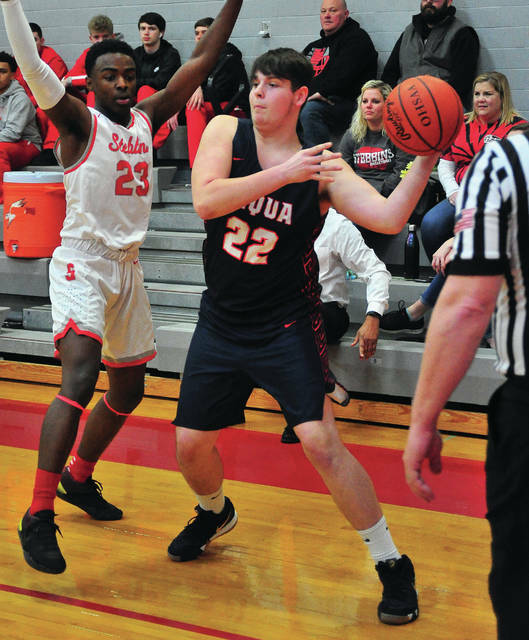 Tucker had a basket with two minutes to go to get Piqua within 66-64, but Christian Rand hit two of four free throws for Stebbins and the home Indians added a late basket for the final margin. The game had started with Stebbins jumping out to a 5-0 lead and they never trailed in the first two quarters. 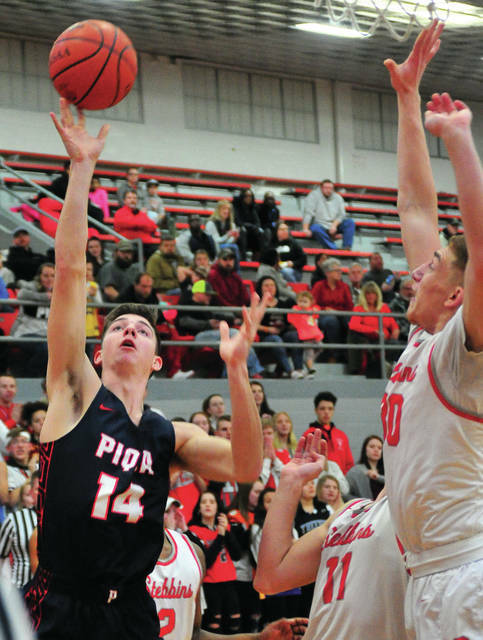 With Tolbert scoring 11 points in the first half and Boles Jr. adding 10, Stebbins took a 25-13 lead after one quarter and 47-33 at halftime before Piqua’s big rally led to a dramatic finish. 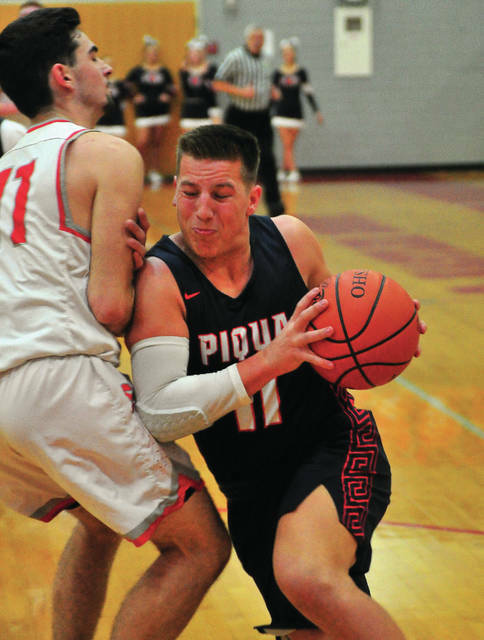 Tucker scored all 12 of his points in the second half to lead a balanced Piqua attack and Mick Karn scored all 11 of his points in the opening half to keep Piqua in the game. Ventura scored 11 points, Darner had nine and Richmond had nine points and 12 rebounds. Tolbert and Boles Jr. both scored 15 points for Stebbins. Piqua was 26 of 54 from the floor for 48 percent and six of eight from the line for 75 percent. Stebbins was 25 of 62 from the floor for 40 percent and 13 of 21 from the line for 62 percent. Piqua won the battle of the boards 31-25, but had 18 turnovers to Stebbins’ nine. Stebbins improved to 5-12 overall and 4-6 in GWOC American play, while Piqua dropped to 5-10 overall and 2-8 in GWOC American play. Piqua will play at Vandalia-Butler Tuesday.